One of the best stories out of the NFL last year involved a number of Philadelphia Eagles who had given their lives to Christ in the last couple of years. 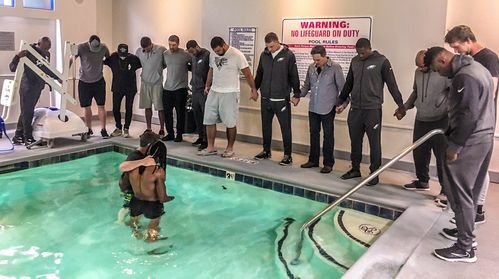 Widely circulated videos showed numerous players being baptized in the recovery pool at the team’s training facility. I’ve never liked the Philadelphia Eagles as a football team, obviously, because of my allegiance to the Cowboys. But the baptisms of some of those Eagle players remind me that Jesus has a way of bringing “rivals” together. Jesus reaches across lines of all kinds. This will be apparent yet again as we tour through Luke 7 this weekend. There are micro-revelations inside each story in Luke 7, and macro-revelations when we see how each story ties together. Take a trip through it and see what the Lord impresses upon your heart. Come ready with friends in tow! I hope to help everyone make a little sense of it, as well as make sense of its implications for our lives. Have you checked out our new website, thebranch.org? It’s designed to be a helpful resource that gives an introduction to The Branch, info/registration for upcoming events, and also resources such as the audio/video of weekly sermons, as well as past sermon series. Please share the link with those in your network of relationships. See you tonight (6:45 pm Vista Ridge) or Sunday!